First of all, Evernote is a great note-taking and note-syncing application and I am using it on daily basis. I use Evernote to keep track of my work, projects, as a personal knowledge base, as a to-do list. What I really appreciate is that all notes are automatically synced with server, so first of all, all my notes are backed up and secondly, I am able to access them not not only from the client app on my laptop, but also from anywhere in the world using web site and what’s even cooler, from my windows mobile phone. And by the way, Evernote is free.I find Evernote very useful, period. But Evernote (at least EvernoteWindows client) has some glitches I really hate. I will blog about them. Hopefully Evernote will fix them one day. This is fine, but what I really miss is a search focused only on selected note. Typically I have a couple of note editors opened as separate windows, hence directly accessible from windows taskbar). And very often I want to search only in one of them. There is no way to do it. Actions such as Find (Ctrl+F) or F3 (Search), that are available huge majority of text editors is not here! 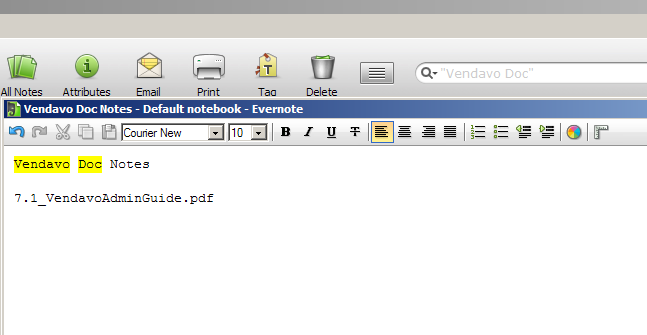 Guys @ Evernote, please add Find/Search into note editort! Thanks.